Additionally, nine of their albums reached the top 10 on Billboard’s 200 chart (2 at #1) and received multiple RIAA certifications for multi-platinum, platinum and gold selling albums and singles. 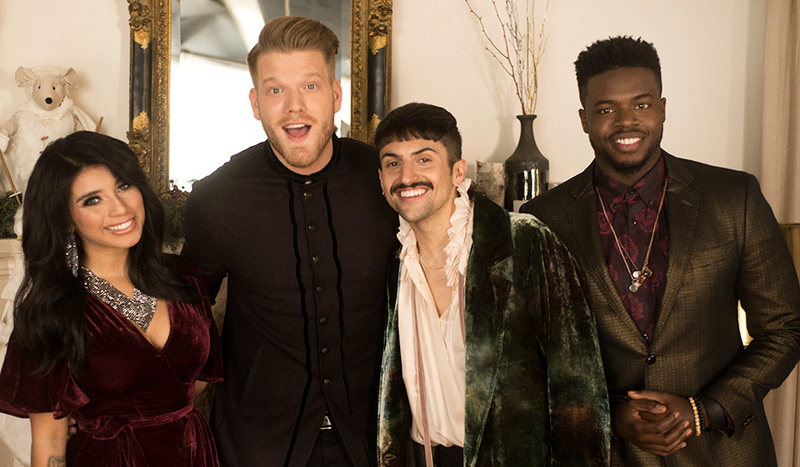 The group has had two holiday specials on NBC (watch 2017's A Very Pentatonix Christmas here), released their tour documentary - On My Way Home - in 2015 and appeared in the feature film, Pitch Perfect 2. Scott is a songwriter and pianist who has been performing since the age of 8. Following his graduation from Martin High School in Arlington, TX, Scott enrolled at USC where he joined the SoCal VoCals, a popular and accomplished campus a cappella group. Involved with a variety of musical projects, Scott has been a finalist on CBS’ Star Search and has performed the National Anthem and “God Bless America” at numerous professional and collegiate sporting events, including home games for the Texas Rangers, Dallas Cowboys and Dallas Mavericks. Mitch is the youngest member of Pentatonix and a recent high school graduate (he was a high school senior when taping of The Sing-Off commenced). In addition to immersing himself in music theater in Arlington, TX, Mitch’s music tastes skew heavily toward underground club and electronic music. A veteran of many vocal and talent competitions, Mitch took first place at the Teen Talent Follies for his rendition of Scott Alan’s “Kiss the Air.” Mitch is honing his skills in production and DJ-ing while excelling as a lead vocalist for Pentatonix. Kirstin is a National Hispanic Scholar and was a sophomore Music Theater major at The University of Oklahoma before joining Pentatonix. She developed her vocal and performance skills during her eight years as a touring member at Theatre Arlington where she’d learned to sing eight-part harmonies. She began her classical training during high school and was a member of the Texas All State Choir for three years. A four-year show choir member and dance captain, Kirstin held numerous roles in local stage productions, performing at shows around the Metroplex, including Casa Manana and Bass Hall.